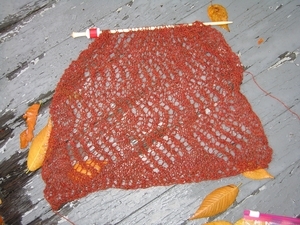 I'm lovin' your lace knittin' perserverence. Go Knitter, Go? well i know it was a long journey but it's looking fabulous now. keep at it! Lookin' good now. You'll be glad you stuck it out. Lace isn't hard you just have to pay attention a bit more. Wow - it looks fabulous! It's actually making me consider giving it a go myself, it's perfect for an office shawl..... which is what you were looking for, right? Yay! Press on, however painful. It sounds like you have a similar love/hate relationship with KSH. I am smitten with its softly lustrous silky beauty. But I have a deep and abiding loathing for its slippery, inelastic ways. It's like a bad relationship. And then I find it on sale and buy up the stock. In black no less. I should probably call Juno's therapist.